Drs. Les Friedman, Kimberly Friedman, Anna Mellinger, & David Kong have acquired the latest technology in digital imaging and networking to help in the diagnosis of eye diseases. The high-tech camera is networked into each exam room so that the doctors can access digital images of your eyes during your eye examination. The doctors have used the camera to help diagnose several cases of diabetes, high blood pressure, and glaucoma. In fact, the doctors have also used this technology for "telemedicine" -transmitting photos of patients in Moorestown to doctors at CHOP and Wills Eye for those patients that required further intervention. Your retinal Images will be stored electronically. This gives the eye doctor a permanent record of the condition and state of your retina. A scanning laser used to analyze the layers of the retina and optic nerve for any signs of eye disease, similar to an CT scan of the eye. It works using light without radiation and is essential for early diagnosis of glaucoma, macular degeneration and diabetic retinal disease. We are proud to be one of the few local dry eye clinics that have obtained specialized testing and advanced education in ocular surface/dry eye disease. Moorestown Eye Associates is a Dry Eye Center of Excellence and utilizes TearLab analysis to diagnose and monitor treatment effectiveness in Dry Eye Disease. 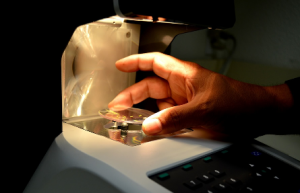 TearLab testing determines your tear osmolarity, which provides significant information about your tear chemistry. With its objective, quantitative endpoint, TearLab Osmolarity correlates to increasing disease severity and enables your doctor to monitor your response to treatment. The test is fast, easy, and accurate – requiring only 50-nanoliters of tear for analysis – a sample smaller than the period at the end of this sentence. It is also more patient friendly than older generation tests, as it is not intrusive, and requires no anesthesia and is completely painless. It is also more patient friendly than older generation tests, as it is not intrusive, and requires no anesthesia and is completely painless. We understand that you can’t wait around for better vision. We stock lenses with premium antireflective or antiglare coatings that provide clear vision while providing lasting scratch protection. Our on-site lab, helps us complete nearly 95% of our patients’ single vision prescriptions in 24 hours or less. Your new lenses will correctly match your frame and will be true to the doctors’ prescription and quality standards.